Bret Hart was unhurt after the unexpected tackle. 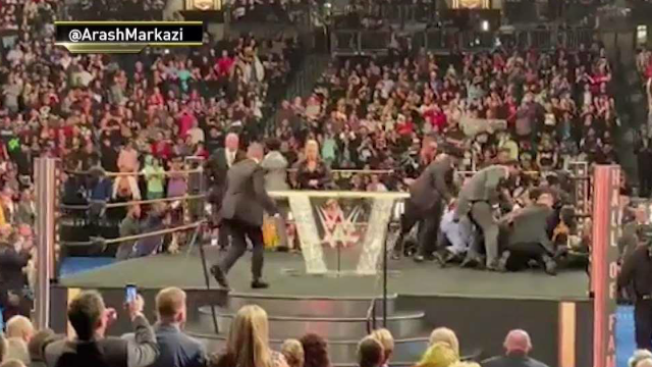 Wrestler Bret "The Hitman" Hart was tackled by a spectator Saturday while he was giving a speech during the WWE Hall of Fame ceremony at Barclays Center in Brooklyn. WWE superstars Braun Strowman, Carmella, Drew McIntyre, Alexa Bliss, Kofi Kingston and Seth Rollins read taunts submitted by kids to see if they can make them sound terrifying. "An over-exuberant fan surpassed our security at ringside and made his way briefly into the ring. The individual has been turned over to the proper authorities," the organization said in a statement. Police arrested 26-year-old Zachary Madsen, of Lincoln, Nebraska. He faces assault and criminal trespass charges. An email to the district attorney seeking someone who could comment on Madsen's behalf wasn't immediately answered. The induction event resumed, with Hart continuing his speech after the fan was taken into custody.